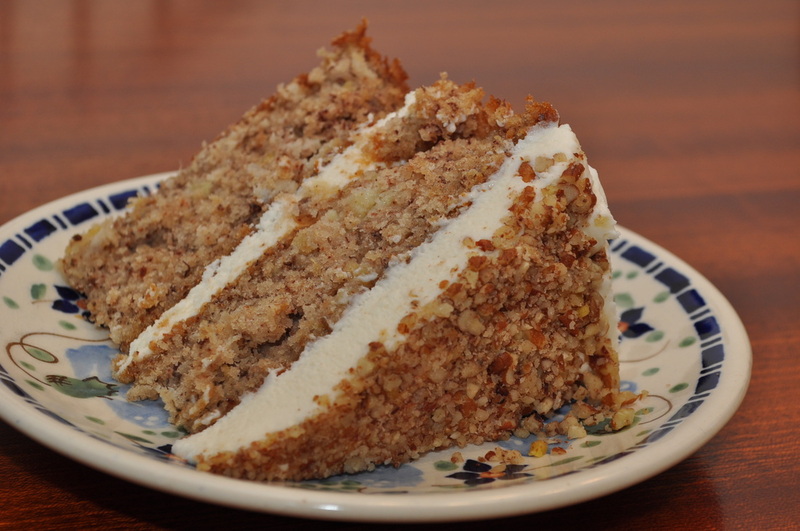 When I lived in Chicago I was lucky enough to get reservations at Table 52, the restaurant Oprah's personal chef opened, and had this AMAZING million layer hummingbird cake. Ever since going there I have wanted to replicate that delicious dessert and here is my not too shabby attempt! I have to admit Art Smith's was better - but come on - he was Oprah's chef! Preheat oven to 350F. Grease two large, round cake pans and line the bottoms with a circle of parchment paper. Whisk together the flour, baking soda, salt, cinnamon, and sugar (remember to remove two tablespoons from the 2 cups - I did this because I added coconut, which is all ready sweetened, and didn't want to over do the sugar content). In another bowl, mix together the eggs, oil, vanilla, pineapple and pineapple juices, mashed bananas, and 1 cup of chopped pecans. Add the wet ingredients to the flour mixture and fold until combined. Evenly divide the batter between the two cake pans and bake for 30-35 minutes, or until a toothpick comes out clean. Cool the cakes on a wire rack for 10 minutes then remove from the pans and cool on the wire rack until totally cooled. Beat the butter and cream cheese until smooth and all the lumps are gone. Gradually add the powdered sugar and beat until smooth. Scrape the sides of the bowl and add the vanilla. Beat until light and fluffy. 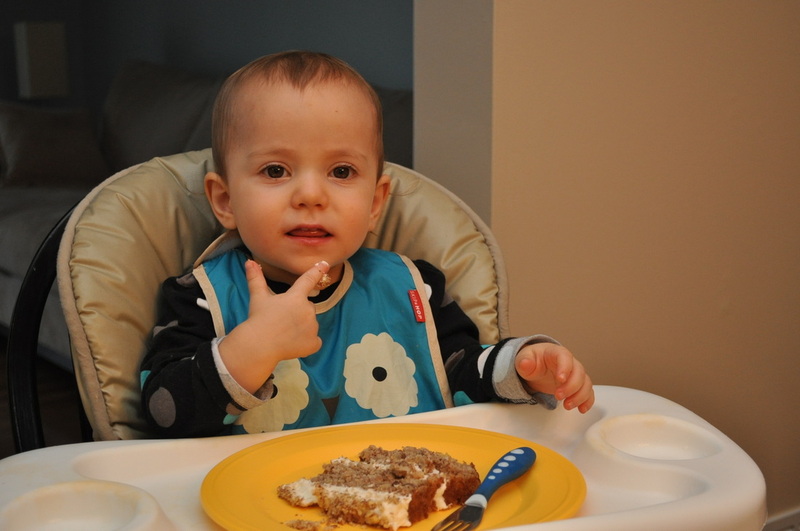 Place one cake, top side down, onto a cake plate. Spread a little less than half the frosting on top and spread around (don't go onto sides just yet). Put the other cake layer, top of cake facing up, onto the first layer, and spread the rest of the frosting over the top (and now you can do the sides IF you have enough frosting - I did not!). 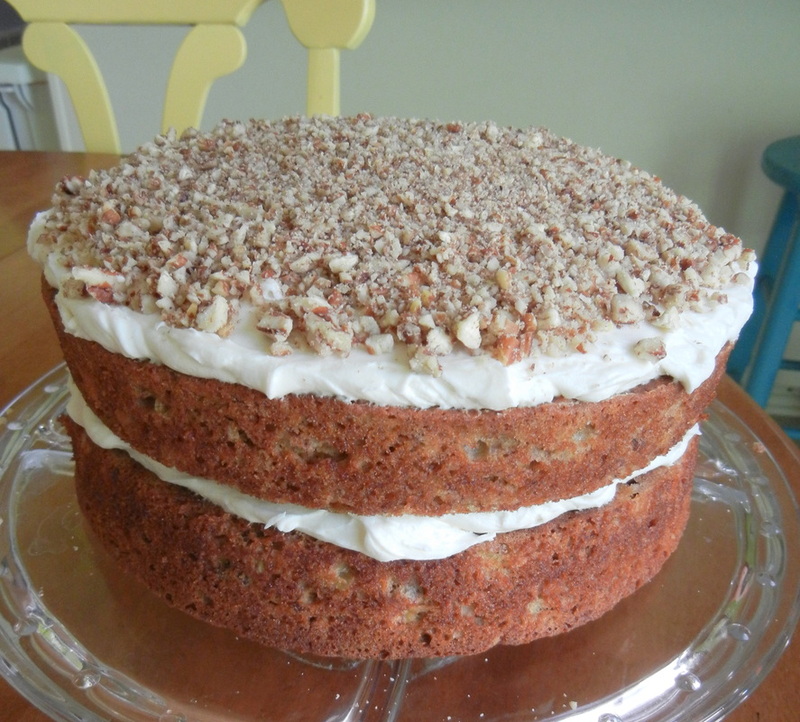 Sprinkle the crushed pecans on top and lightly press them into the frosting. Refrigerate the cake for a bit so the icing sets, especially if it's hot out! Art's cake may have been good enough for Oprah but mine got the approval of one of my favorite little girls - she loved it! Caprese salad is one I make all the time in the summer months once we start getting good Jersey tomatoes. Burrata cheese is a fresh Italian cheese that is made of mozzarella and cream. It is very similar to fresh mozzarella but the center is creamy. Along with roasted tomatoes, burrata cheese adds a nice twist to caprese salad. Half the tomatoes and toss with olive oil, salt and pepper. Roast in a shallow baking pan under broiler for a few minutes until skins just start to get browned. Remove from oven and let cool while you prepare dressing. Arrange salad greens on a serving plate, top with burrata cheese and the tomatoes (which should be about room temperature by now). Sprinkle the julienned basil on top of the cheese and tomatoes. Then drizzle the dressing over all and serve immediately. If making ahead, add dressing right before serving. 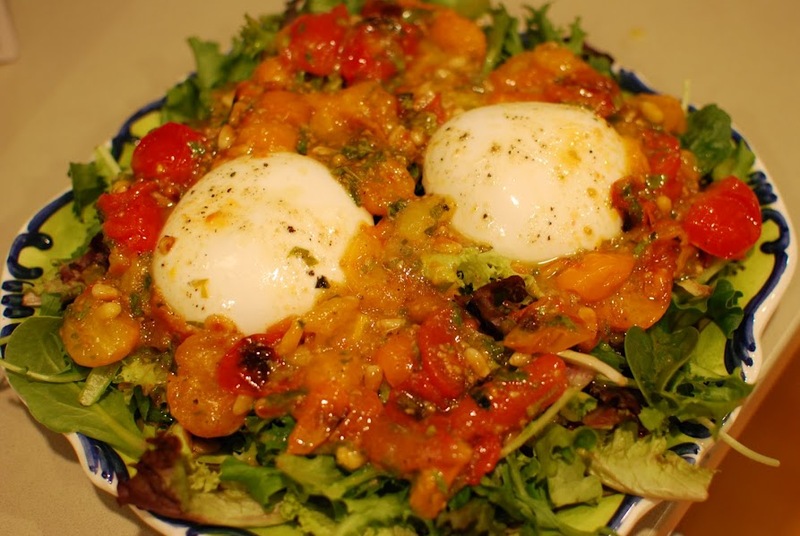 This is an easy but delicious summery salad that I KNOW I ate long ago at Emily's beach house, but she has no rememberance of it...who knows where it came from but it was great and here's what i came up with from what I tasted (or perhaps imagined I tasted). Cook the tortellini according to package directions being careful not to overcook (test pasta atleast 2 minutes prior to recommended cooking time). Drain and place in a large serving bowl. Heat a large saute pan over medium heat and drizzle in a titch of olive oil. Slice your keilbasa into little disks about 1/8-1/4 inch thick. Working in batches so you dont crowd the pan, brown the keilbasa on both sides in your saute pan. Don't stir them too much, just add them to the pan and then flip them when they are browned. 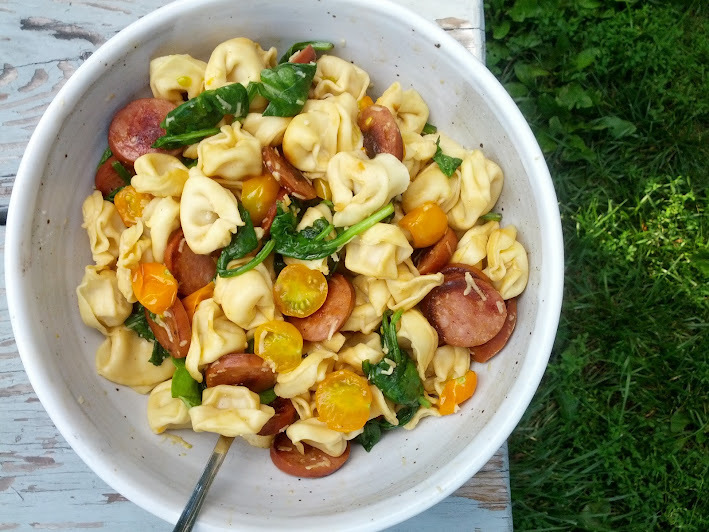 As they are done, add them to the bowl with the tortellini. Don't wipe out your keilbasa pan. Wash spinach well and add that to your saute pan. Cover with a lid and let it wilt slightly. This will only take a minute or maybe less. Add the spinach to your bowl. 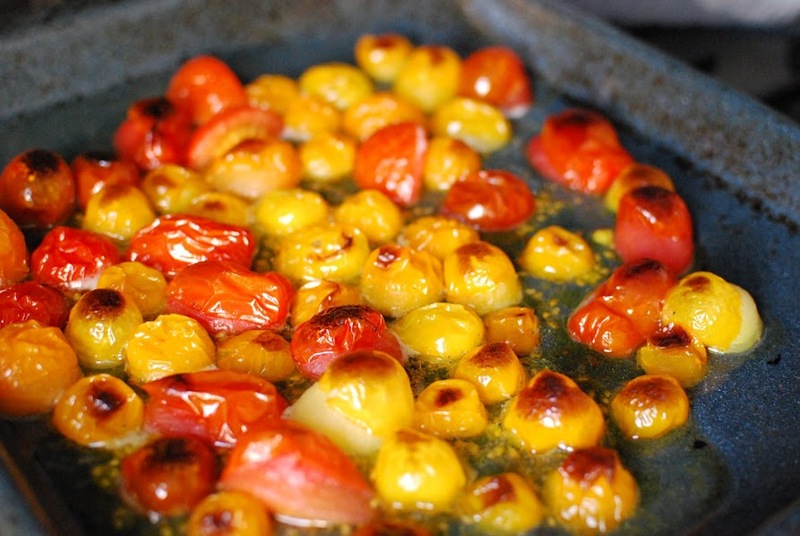 Add the tomatoes to your saute pan and cook just until warmed through, maybe a minute. Add the tomatoes to your bowl, as well, then top with parm. 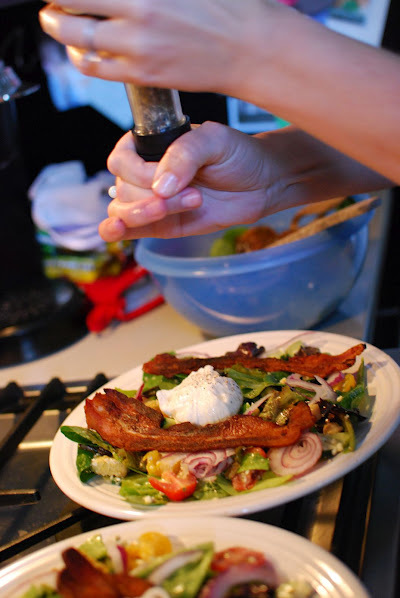 Note: If your keilbasa is leaner (like turkey keilbasa) you may need a drizzle of olive oil over the salad. Salad can be eaten warm, room temp, or cold. Serves 6-8. There is an awesome ice cream shop in our town that we love to go to in the summer called Washtenaw Dairy. They are the real deal...homemade donuts, homemade ice cream, a kiddie size that could feed a horse and a line wrapped around the corner every time you go! 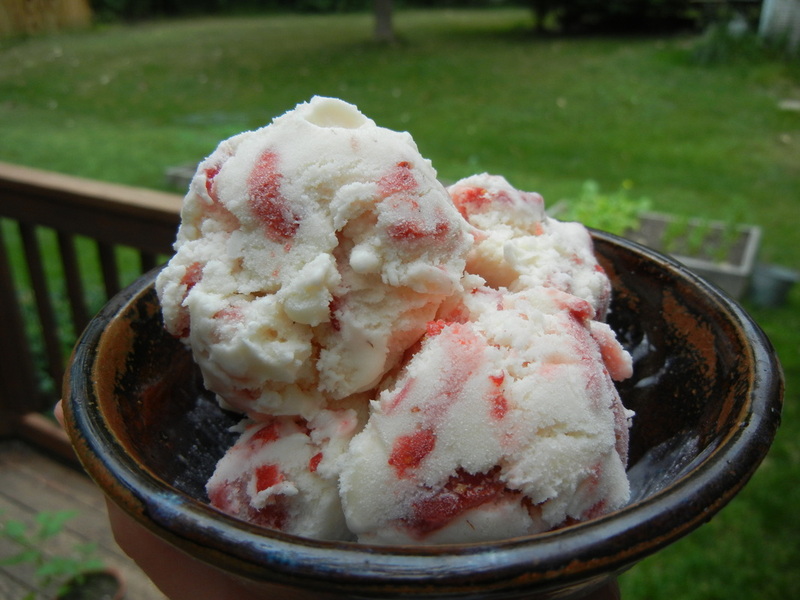 But...after making this recipe for strawberry ice cream my visits may become less and less frequent! It's pretty amazing. And making it with fresh strawberries just adds that little bit of summertime wonderfulness that makes it taste even better! Mix the strawberries with the 1/4 cup of sugar and gently mash them up. Set aside in the fridge for later. Heat the milk (not the heavy cream) in a sauce pan over medium-low heat. Prepare an ice bath by setting a 2-quart bowl over a larger bowl partially filled with ice water. Set a strainer over the smaller bowl and set aside. In a separate bowl or in your mixer, whisk together the egg yolks and cup of sugar until pale yellow in color and the sugar has dissolved. Remove the milk from the heat. Gradually pour the warmed milk into the yolk mixture, whisking constantly. If you heat your milk too much then when you add it to the yolks some of the eggs may "scramble" - if this happens it's ok - you can strain out those pieces later. Pour the mixture back into the same saucepan you used to warm the milk. Cook for 3 to 5 minutes over medium heat, stirring constantly, until the custard thickens and coats the back of a wooden spoon. (You can tell it's right if you dip the wooden spoon in the batter and then draw a line in the batter on the spoon with your finger - if the line stays you are good to go!). You don't want the batter to boil or foam or bubble - this means your eggs are scrambling! Strain the batter into the top bowl of the ice bath to stop the cooking process. Add the heavy cream and vanilla and stir over the ice bath until cool. Cover the bowl with plastic wrap and chill for about 8 hours. Follow the instructions on your ice cream maker to make the vanilla ice cream base. As the ice cream gets harder and more frozen (like soft serve consistency) add your strawberries and their juices until combined. Take a bite...heck, serve yourself a bowl if you are not patient enough to wait any longer...or you can put your ice cream in the freezer for a bit to get it to hard ice cream consistency. And enjoy!!! This is a cocktail to be served in a brandy snifter, with a lot of ice. It's a strong fancy rum drink.... the perfect ending to a long day with the kids! Muddle cilantro and juice from 1/2 lime. 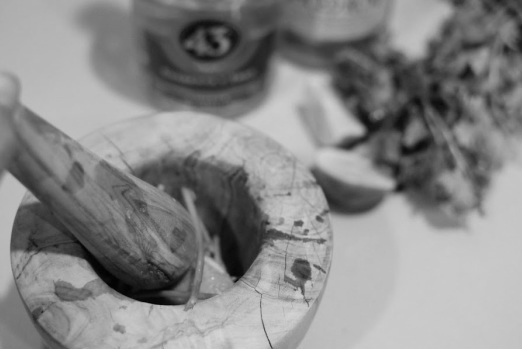 In shaker filled with ice, combine rum and Liquor 43 and juice from the remaining 1/2 of lime, and shake vigorously. 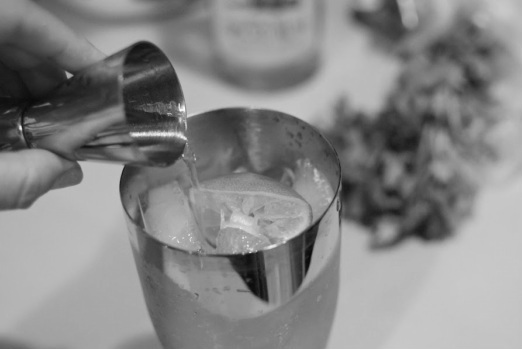 Fill your glass with muddled cilantro and lime juice, then top with the rum/Liquor 43 from shaker. Garnish with a piece of lime and serve immediately. My girl friends and I had an absolutely awesome dinner at this place in Saugatuck, Michigan called Phil's...nothing fancy about the name or the look of the place, but the food was really amazing. My favorite part of our dinner was a black bean quesadilla (which was our first course, followed by some incredible fish tacos!). Here is my not-too-shabby attempt at making something just as tasty at home. Pre-heat your oven to 350F. 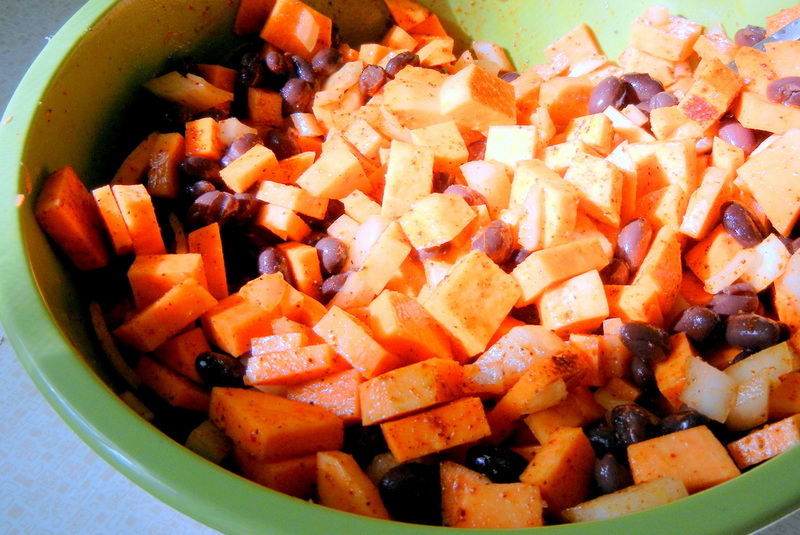 Mix together the black beans, garlic, lime juice, sweet potatoes, onions, and jalapenos (if using) along with the cumin, chili powder and a sprinkle of salt and pepper. 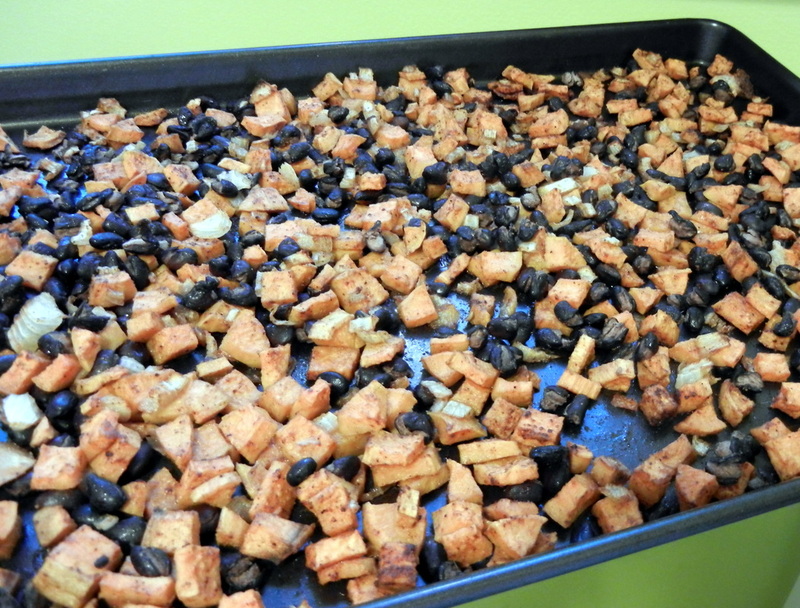 Toss in a bowl with the olive oil and then spread along a baking pan in an even layer. Cook, mixing and tossing every once in a while for about 20 minutes or until the sweet potatoes are tender (stick with a fork and taste). 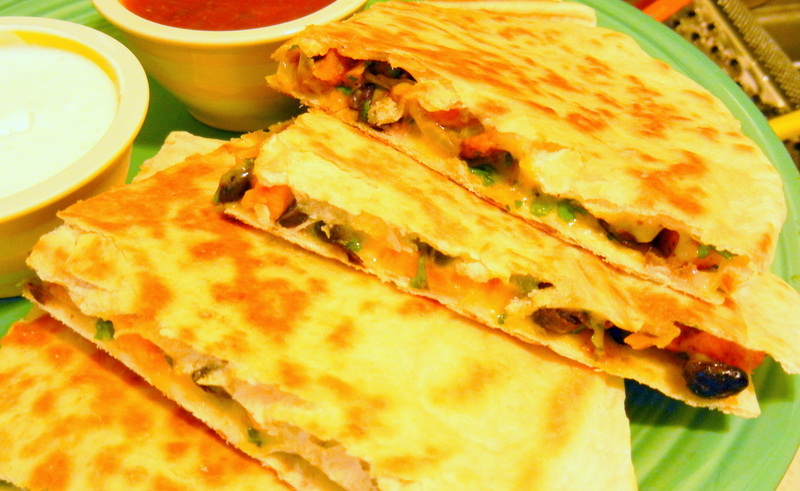 Heat up a pan or skillet for making your dillas. Melt butter or spread a thin layer of oil on the pan. 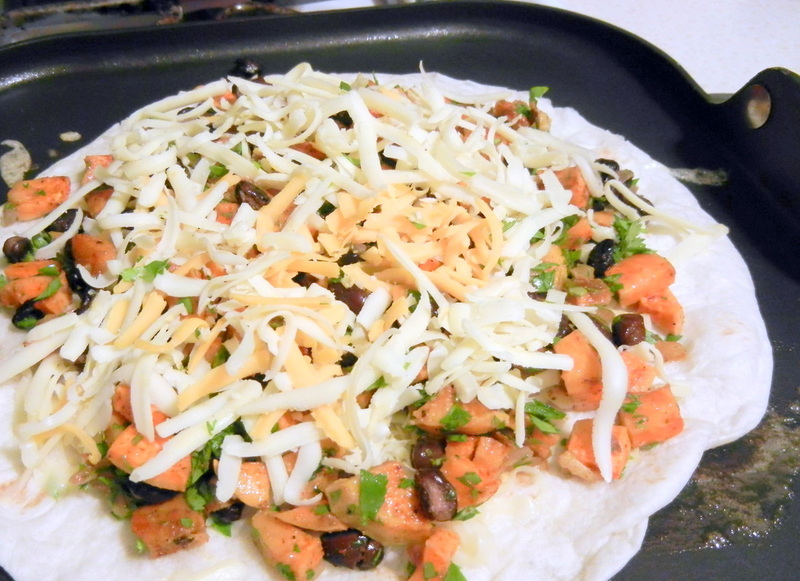 Arrange your quesadilla by layering a tortilla, black bean/potato mix, a sprinkle of cilantro, and finally layer of shredded cheese. Top with another tortilla and cooked on both sides until lightly browned and perfectly crispy. You might need two spatulas to turn these puppies over if you use big tortillas like I did! Use a knife or pizza cutter to slice into wedges and serve with sour cream, salsa, and a sprinkle of fresh cilantro. Step aside Phil...these are darn good! I have been perfecting this pie ever since trying Mandy's Strawberry Rhubarb Bar recipe for the first time years ago. That recipe is so good, and I make it every summer as soon as we start getting some good berries, always experimenting with it by changing the fruits (peaches, blueberries, or a combo of different berries), then one time I moved it to a pie dish, added crust and made a couple other little changes with the prep.... Suddenly I have a mean blueberry pie. Like the Rhubarb Bars, this too is really, really good. If you're not afraid of making pie crust, you've got to try it. Make the crust ahead a day or two to save time. 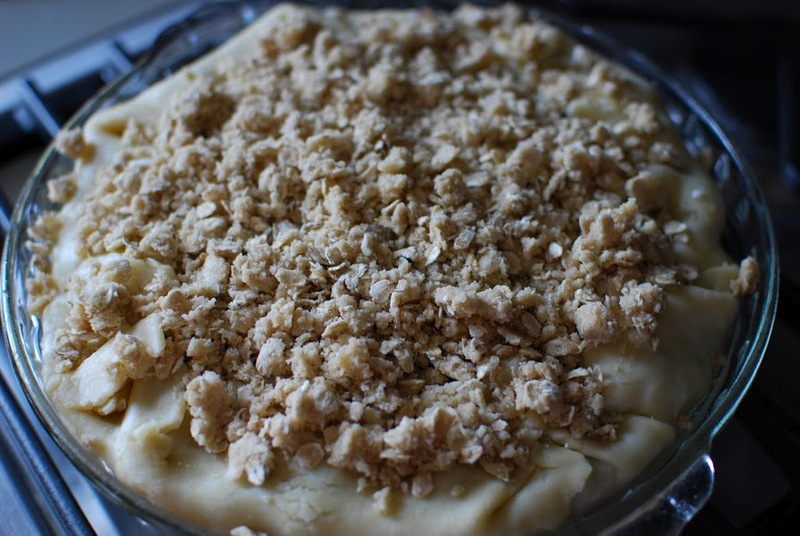 If you are afraid of making pie crust, or you're in a pinch for time, make it with a frozen pie crust until you are ready to take the next step. To make the crust: In a large mixing bowl, whisk the flours, sugar & salt. Add the shortening and the butter to the flour mixture, and using a pastry blender, cut it until the butter resembles small peas. You can also use two knives but you will do a LOT of cutting to get to the appearance of small peas. In a small separate bowl, beat the egg with 1/3 c of the water and the vinegar. Add the egg mixture to the flour/butter mixture gently tossing with your hands just until it comes together in a ball. If the dough is too dry, add another T of ice water. Gather the dough together on a CLEAN lightly floured surface and divide evenly into 2 balls. Flatten the balls until about 1/2" thick and then wrap tightly in plastic wrap and fridge at least 1 hr. If not using right away, fridge for a couple days or freeze for up to 3 wks. If frozen, thaw for 1 day in the fridge before you roll it out to use it. 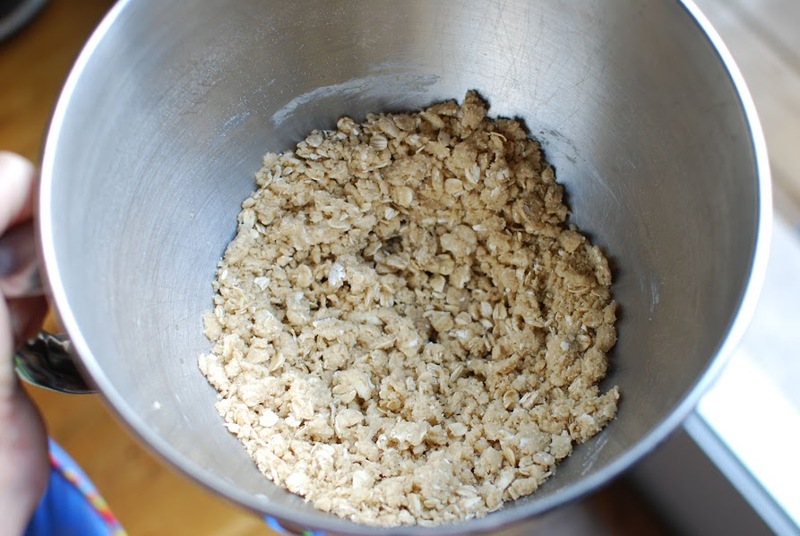 Combine all topping ingredients in a mixer on medium speed until looking crumbly (see pic). Set aside. On a floured piece of parchment paper, roll out the cold pie crust until it is very thin and a few inches bigger than the pie plate (so it drapes about 2 " over the edges on all sides). Sprinkle flour on the rolling pin and on the dough as you roll it out so it doesn't get sticky. When ready to transfer to the pie plate, put the pie plate turned upside down over the rolled-out crust, and then flip the pie plate WITH the parchment paper/crust ALL TOGETHER. Peel off the parchment paper and let the crust sink into the pie plate carefully. No need to trim the edges because you will fold the uneven edges all over the blueberries and then cover with crumbs so no need to be neat here. Prick all over the dough with a fork. Rinse blueberries in water and drain. Transfer to a medium bowl. 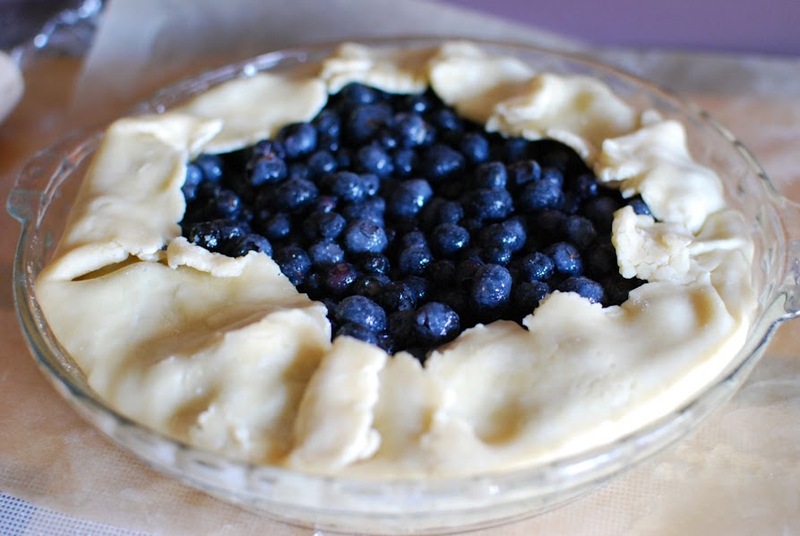 Add the lemon juice, sugar, cornstarch and flour; toss until all blueberries are evenly coated and then fill the pie shell with this mixture. 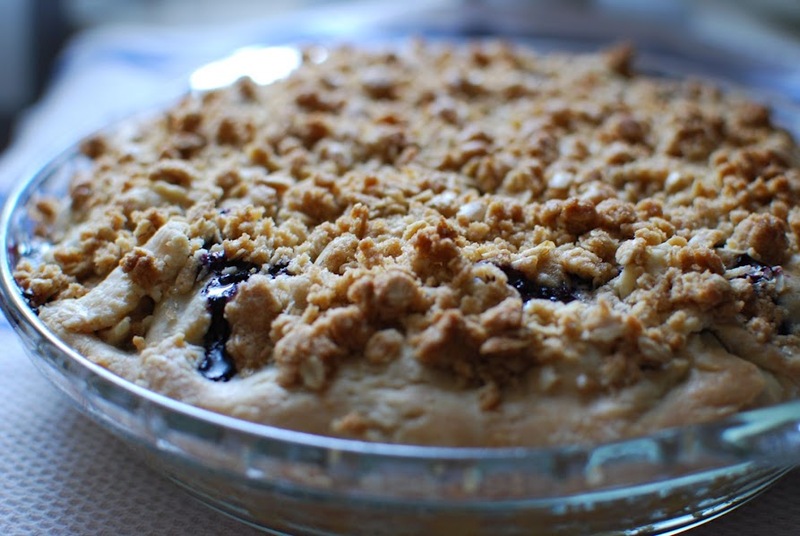 Fold the edges of the uneven crust inwards towards center of pie, and then dump crumb topping mixture in center of the pie plate on top of the blueberries and slightly on top of the crust near the edges of the pie plate. 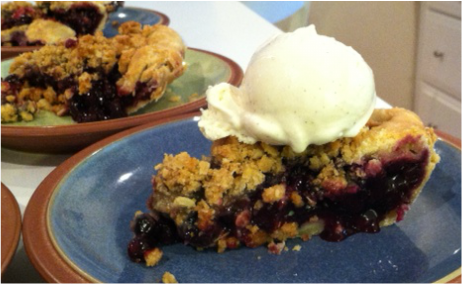 The crumbs can cover the pie crust a little, but keep the crumb topping mostly in the center over the blueberries (see pic). Bake at 350' for about an hour until you can see blueberries bubbling thru the top and the crumb top is lightly browned. Let cool before cutting and you will get pretty clean pieces of pie (see pic). This pie will stay together once it's at room temp. Suggest to serve with vanilla or Salted Caramel Ice Cream. I love a refreshing summer cocktail, but I tend to not like cocktails that are super sweet (unless I am having it for dessert). 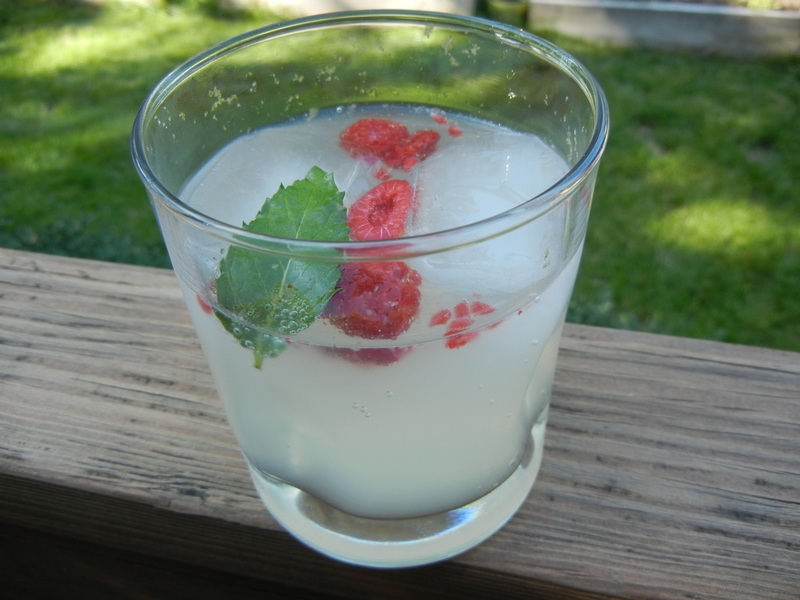 I looked up a bunch of raspberry mojito recipes before coming up with what I think is the best combo of ingredients. 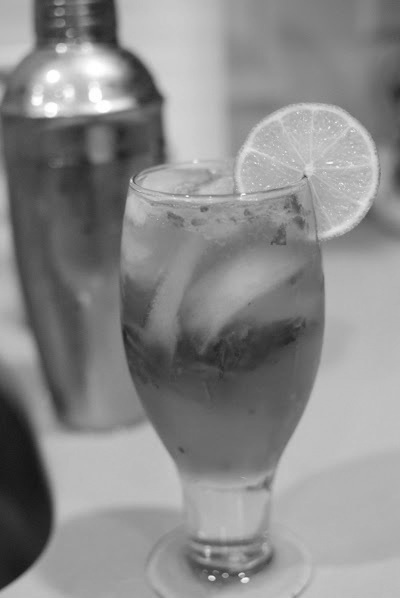 It is light and refreshing, slightly sweetened, and has a delicious bite of lime. Have you ever been raspberry picking? I have had two experiences, the first was awesome...a sunny warm day in Michigan and my mom was visiting. We laughed and ate as we picked, we took pictures and just enjoyed the company and the beautiful day. We picked so many raspberries, we went home and made 2 dozen jars of jam! The next time I went it was super hot and muggy, the mosquitoes were particularly vicious, and we felt terrible because we had convinced our friends to come with us and both left bee-stung and bug-bitten...we only lasted about 15 minutes, which got us about a handful of berries. So this year, I decided to support my hard working local farmers, and pick up the berries at the farmer's market! Great decision. If you have a bad experience picking berries I would suggest making this drink right when you get home - don't worry if it's not happy hour! First, bring your sugar and water to a boil. 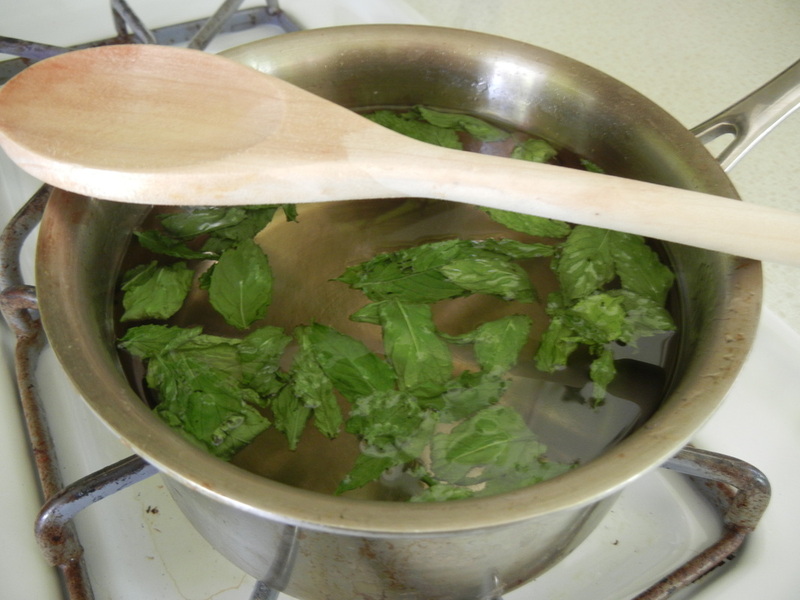 Once boiling and sugar is dissolved, remove from the heat and add your mint leaves. Stir and and then cover and let steep for 1 hour. After your mint water steeps, strain out the mint leaves and you are left with mint infused simple syrup. To make your cocktails, fill a tumbler glass with ice. Add 1 shot of rum, 1 shot of simple syrup, a small bunch of raspberries, a couple fresh mint leaves, 1/2 shot of lime juice. Top off the glass with just enough club soda to fill the cup and serve....or sip...or gulp! In the hot summer weather, sometimes you just need to eat salad for dinner. It's too hot to eat a big plate of hot food. But, it's also dinnertime, and we want something more substantial than just salad. So... here's a different way (other than adding chicken) to make that salad feel like a meal. 1 Tbs fresh lemon juice. Begin cooking bacon til crispy. Dry/cool on paper towels and set aside. Meanwhile fill a large bowl with all salad ingredients: lettuce, tomatoes, cucumber, red onion, beans. 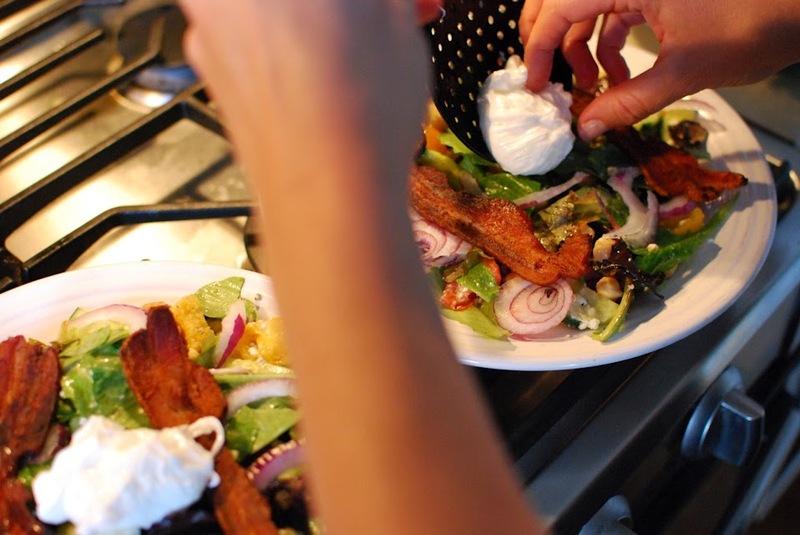 In small separate bowl, whisk together the dressing ingredients and set aside. To poach your eggs: Boil water in a small pot with 1 tsp salt and 1/2 cup vinegar added to the water. While waiting for water to boil, get a small bowl of ice-water ready in the sink. Carefully crack the eggs into a ladle or small dish, then place the ladle or dish just over the boiling water and turn the bowl so they slide into the water very carefully instead of plopping in and making a splash. Boil for 2 minutes. Immediately remove eggs from the boiling water with a plastic slotted spoon, and carefully place the eggs in the ice-water for 30 seconds to stop them from cooking. The middles will be runny but the outside will be cooked delicately. Set aside in a bowl. 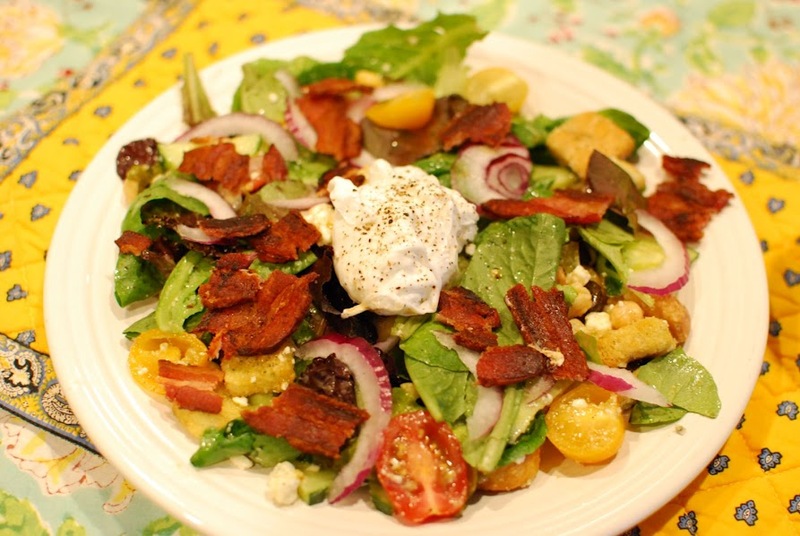 When you are just about ready to eat, add croutons and dressing to the bowl of salad ingredients, and toss to coat all the veggies and croutons. You don't have to use all the dressing, you can set some aside on the table for those who want to add more to their salad. 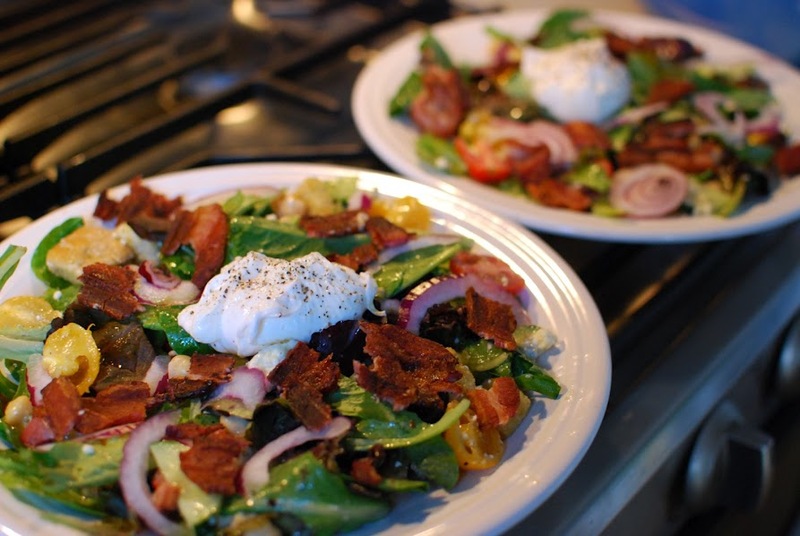 Then transfer salad to large plates for individual servings, top each plate with 2 strips of crumbled bacon, and 1 of the poached eggs. Sprinkle salad with some fresh ground pepper and serve! I am really in love with mango...well, mango flavored anything (the texture of mango is not my fave). But mango drinks, sauces, salsas, sorbets....I love them all! I messed with a few recipes to get this Mango Sorbet pretty darn perfect. It's smooth and creamy and not too sweet, I hope you like it! Put all of the ingredients into a blender and puree until smooth and creamy. If you have an ice cream maker, follow the instructions from here out, using this as your batter. If you don't, simply freeze this batter for a few hours or over night and voila! I find using an ice cream maker makes for a fluffier sorbet where simply freezing it from the blender make it a little more compact. 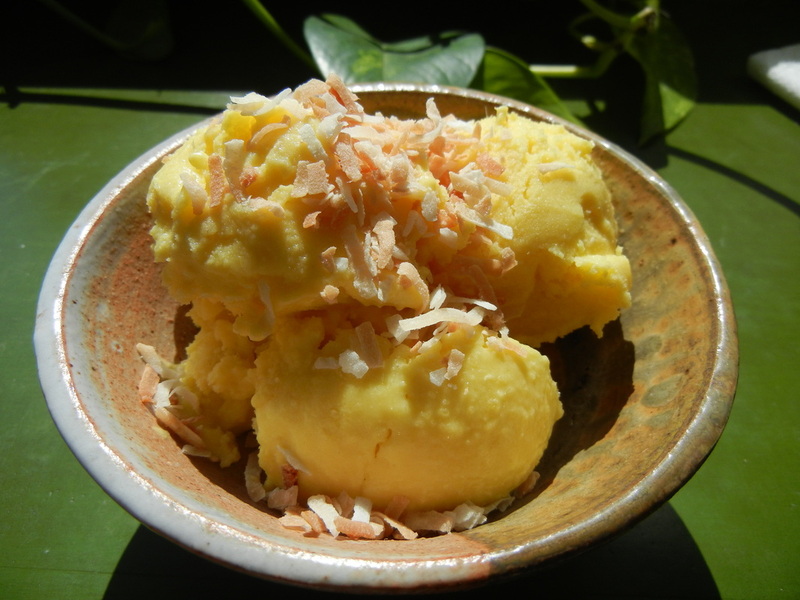 Top your sorbet with toasted coconut and enjoy! *I toast the coconut in the oven. I preheat the oven to 350 and spread a single layer of the flakes on a baking sheet and cook until they are just lightly golden brown. It only takes a few minutes and you have to keep an eye on it because it burns easily, and burnt coconut is not tasty...trust me, I have tried to salvage a neglected batch! Depending on your oven, you may need to turn/toss the coconut halfway thru cooking it (my oven cooks the edges of the pan before the center). Note: I have tried subbing the mango for other fruits and while it is still tasty, it is not the same consistency as with mango. I think mango freezes differently and makes for a creamier sorbet, where other fruits, like strawberries, make it more Italian-ice-like. Welcome to The Sisters' Palette!We are so glad you came to our site - please feel free to post your feedback, share your own recipe tweaks and follow us to keep updated on everything we are cookin' up!